Enter for a Chance to Win $3,000 to Get Financially Fit! Yes, paying off credit card debt every month is vital for financial health, but it’s also much easier said than done. Balancing the costs of essentials like rent and childcare with self-care necessities like gym membership and Netflix is a challenge that takes time and work to master. That’s why, in honor of Lindsay Stanberry’s highly anticipated upcoming book MONEY DIARIES (out in September), Refinery 29 and Touchstone Books are teaming up for an amazing sweepstakes to help you stop the over-spending cycle and get financially fit! 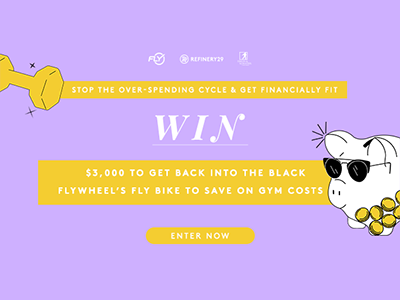 One grand-prize winner will receive $3,000 to get back into the black and one of Flywheel’s Fly Bikes to save on gym costs. Click here to learn more about the sweepstakes and enter for a chance to win! Don’t wait–the sweepstakes ends on August 6. Good luck! Share Enter for a Chance to Win $3,000 to Get Financially Fit!